A Stranger Earth: Who Shot Kennedy: The Driver? Who Shot Kennedy: The Driver? Happy New Year, Dear Constant Reader. It has been a long time since this blog was updated due to a mixture of a lack of time and a lack of inspiration. However it is the year of the 50th anniversary of the assassination of President John F. Kennedy and last night I finished Stephen King's 11.22.63. There is plenty of mystery (or at least plenty of things people like to claim are mysterious) surrounding the events of that event and I thought I'd take a look at some of the theories. Let us start with one of the more unexpected. 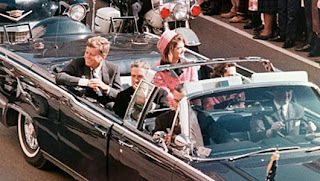 Secret Service Agent William Greer was driving President Kennedy, the First Lady, Texas Governor John Connally and the Governor's wife Nellie on their trip through Dallas. Greer was an Irish immigrant to the United States who had worked for the Secret Service since October 1 1945 (see his testimony to the Warren Commission here). He had risen up the order of seniority, driving back up cars, sometimes chauffeuring for President Eisenhower and, more often, for Mrs Eisenhower. He became the main chauffeur for the President upon the inauguration of President Kennedy. Now for some reason people seem to see in the videos of the assassination something sinister in the driver turning around after the first shot. See this popular Youtube video. I just don't see it. To take the shot he'd need to use his left hand. I just don't see his left hand move off the steering wheel. Further research, picture analysis and use of common sense can be found here. This assassination is a hotbed of discussion and armchair detective work. Unfortunately in the fever to provide something "new", people are willing (on the flimsiest evidence) to accuse the most innocent of people of murder. I'm afraid as we move into the more meatier and popular theories we shall see this on an even larger scale. Alas.